On our second day in Hakone, we went for a stroll around Hakone-Yumoto and watched two famous waterfalls guarded by a duck with a red ribbon. It gladly accepted bread crumbs as a bribe for letting us pass. After the waterfalls, we took the train bound for Gora to pay a visit to the Hakone Open Air Museum. As the train climbed the mountain, the weather got worse and worse. Not only was there even more clouds stopping us from seeing mount Fuji, it also started raining! Since we didn’t feel like visiting the museum while it was raining, we took a detour for a couple of hours and came back later when the weather was a bit better. If you ever find yourself in Hakone, I highly recommend visiting this museum. The sculptures really are something! This is one of my favourites and it kind of reminds me of the “Silence in the Library” episode of Doctor Who. 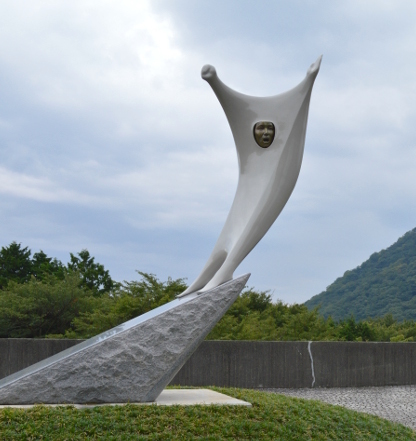 Categories: Japan, Travels | Tags: art, Hakone, Hakone Open Air Museum, Japan | Permalink. We’ve now spent three jet lagged days in Hakone, a hot-spring mountain area south-west of Tokyo. 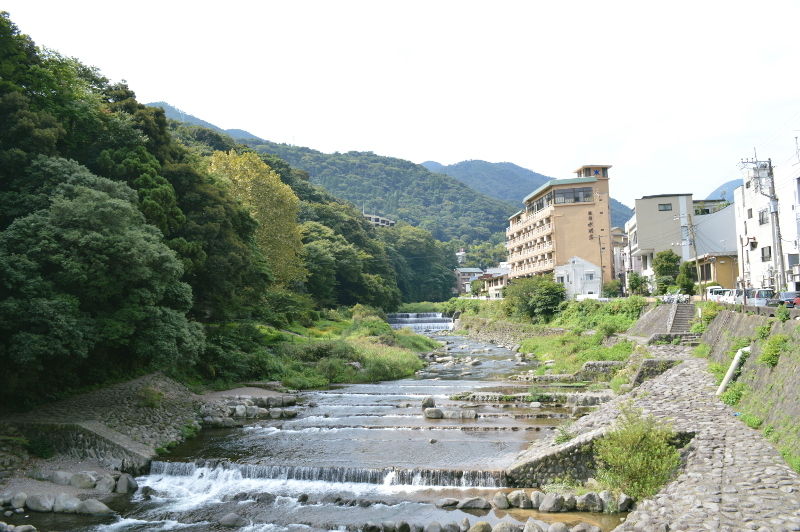 The ryokan, Hakone Suimeisou, that I booked for our stay was just a 5 min walk from the train station in Hakone-Yumoto. With a wonderful view of the river, I don’t think you’ll find a ryokan (traditional japanese hotel) with a better location. 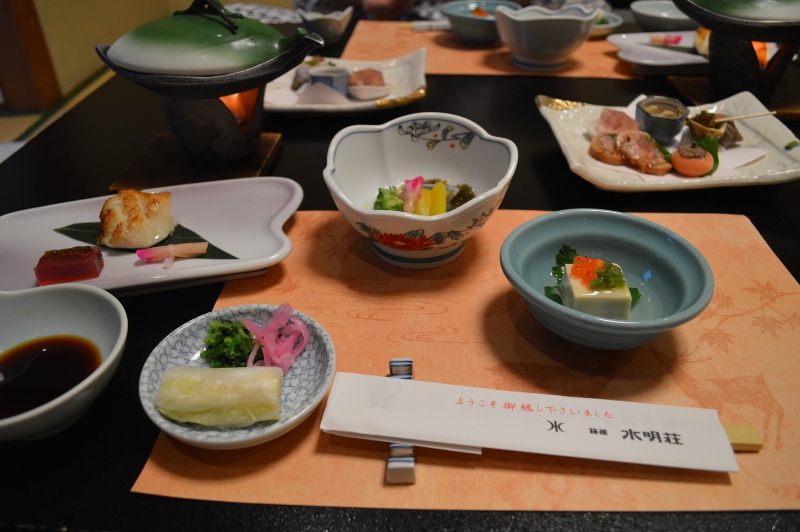 As with all ryokans, it was a bit pricey but the room we got was very nice, the staff friendly and helpful and both dinner and breakfast was excellent! Suimeisou also has a public onsen for both indoor and outdoor bathing. Men and women bathe separately but if you’re staying at the ryokan as a couple, I recommend booking the private outdoor onsen for 2000¥/50 min. Relaxing in the warm water is such a great way of starting the day that we rented the private onsen every morning before breakfast. After having spent our first night in Japan, we set out to do some sightseeing! We began our journey by taking the train to Gora. The train climbs the mountains painstakingly slow but going any faster on these winding tracks doesn’t seem to e a good idea. It never ceases to amaze me how people can build things in remote areas like this one. But more importantly, just who thought of it? and why? From Gora, there’s a cable car going up the steep hill to Sounzan where a rope way takes visitors the last way up to the top of Owakudani. The Owakudani station is sometimes closed off due to toxic volcanic gases but luckily not when we were there. As we got out, we felt the chilly air that smelled of sulphur. At this point, I really wished I had brought a sweater along, but as the sun peeked out of the clouds it felt a bit better. We walked up the hill to where they cook the eggs and as we walked, we noticed the tiny, tiny rope way that was carrying a basket of black eggs down to the rope way station (for people). At the top, we bought 5 eggs for 500¥ they were absolutely delicious! 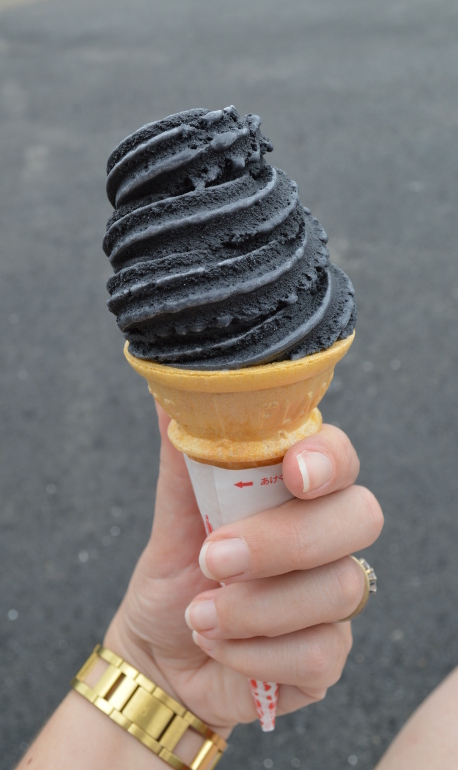 As a matching dessert for our black egg lunch, we bought some black ice cream! It was equally delicious but of course I ended up covering half my face in black goo :). Full of new gained energy we set out to, instead of taking the rope way down to the other side of the mountain, take the hiking trail down. It was a nice walk among trees and bushes that were a bit special to the area. Not all plants are able to survive in a volcanic area like this but these plants have adapted. 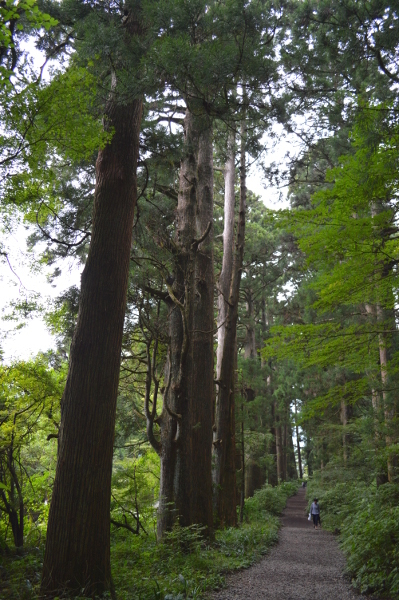 When we arrived at Hakone-machi, on the other side of lake Ashi, we went for a walk to Moto Hakone in search of the cedar avenue. At first we thought we had missed it and spend some time feeling utterly confused but let me tell you this, one simply does not lose a bunch of insanely large and tall trees. When we were tired and started to lose all hope of ever finding them, they were right in front of us. From Moto Hakone, we took the bus back to Hakone-Yumoto where we arrived just in time to enjoy a quick nap before dinner. 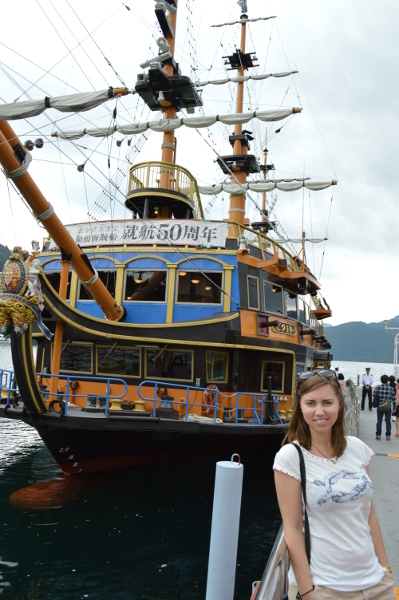 Categories: Japan, Travels | Tags: Hakone, Japan, Owakudani | Permalink. Ever since our first trip to Japan we wanted to go back and today we finally landed at Narita airport. It was a long flight and we couldn’t get much sleep but we got to enjoy a lot of movies. For instance, how about the epic title “Space pirate captain Harlock” or “Terumae Romae 2”, in which a roman bath builder is transported to present day Japan where he find inspiration for new bathing facilities. We also got to experience our first earthquake! Just as we sat down to eat lunch at Odawara, the ground started shaking. At first I thought that I was just too tired, the next thought was “why is someone rocking my chair?” and then “why is the lamp in the ceiling moving?”. Aparently, this was a quite big one (5.6) but we were (luckily) at the outskirts of it. Categories: Japan | Tags: earthquake, Japan | Permalink.